(Above) A 40-year-old man was allegedly knocked down by a car leaving the premises of Platinium Dogs Club. A confrontation between a group of dog lovers and a woman understood to be operating a pet boarding service yesterday took a dramatic turn when a man was allegedly knocked down by a car. The group consisting of 11 women and men, some of whom had used the boarding service of Platinium Dogs Club, gathered outside its premises - a semi-detached house in Bukit Panjang - at about 3pm. 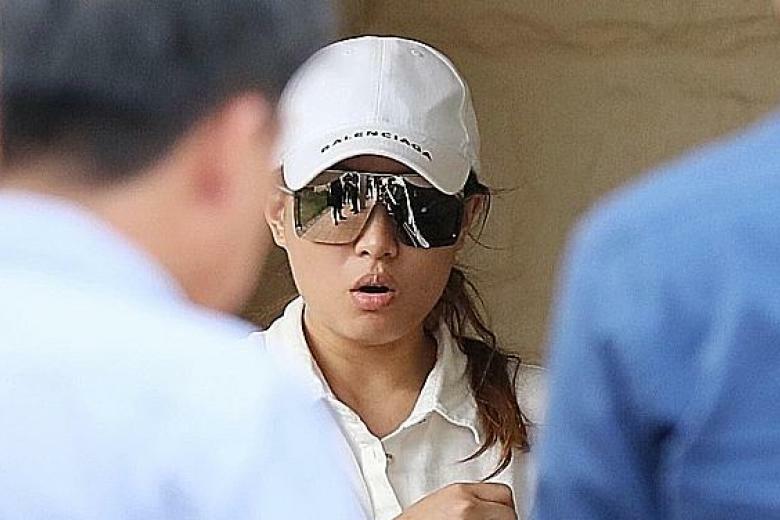 They wanted to confront the alleged owner, Ms Charlotte Liew, about a dog belonging to one of them that had allegedly gone missing while under the care of Platinium Dogs Club. Platinium Dogs Club is under investigation by the Agri-Food and Veterinary Authority of Singapore (AVA) following complaints of mistreatment by dog owners who used its services. Its website, which advertises services such as grooming, daycare and boarding, has been taken down. The police later arrived at the house and told the group to move away from the gates so Ms Liew could leave in a black Jaguar driven by her male companion. A police spokesman said: "At about 4.35pm, the police were alerted to a case of a group of people who had gathered outside 7 Galistan Avenue and was obstructing its driveway. "Preliminary investigations revealed that a 40-year-old man from the group had alleged that he was hit by the vehicle as it was reversing out. "The 33-year-old driver and the group of people comprising seven women and four men, including the 40-year-old man, are currently assisting with police investigations." The New Paper understands that the group, including the injured man who was taken conscious to Ng Teng Fong General Hospital in an ambulance by the Singapore Civil Defence Force, is being investigated for unlawful assembly. At least four more police vehicles turned up after the accident, and the Jaguar drove back into driveway of the house while the group loitered outside. A police cordon was set up to restrict access to that end of the road where the house is located. The group members told TNP that they had gone there after being informed by Ms Liew's neighbours that she was at the house. They wanted to get information on the missing dog, a shetland sheepdog named Prince, belonging to Ms Elaine Mao, who had left it at Platinium Dogs Club on Dec 16 and had not received any news of it since last week. At about 7pm, the Jaguar drove out and Ms Liew, who is also known as Rachel by some customers, was seen coming out to lock the gate. When she saw a poster of Prince stuck on the gate, she ripped it off and tossed it into a bin as Ms Mao, 34, a bid manager, tried to hold back her tears. Her partner, Mr Matt Rowe, 34, a network engineer, said all they wanted was to get some answers after their dog went missing. "The way she responded shows that she clearly doesn't care about any of the animals involved. It is a nightmare. I wish we never came here." A video that was uploaded on social media at 10.45pm last night shows Ms Mao kneeling before Ms Liew to ask about Prince. Ms Liew is seen ignoring her. The video is understood to have been recorded before the accident occurred. The AVA inspected the house last Saturday and found 18 dogs and a rabbit. The AVA, which conducts investigations following allegations of mistreatment of animals, took temporary custody of the animals and has since reunited most of them with their owners. Its officers were also at the house yesterday, but it was unclear what they were doing there. AVA's investigations are ongoing.